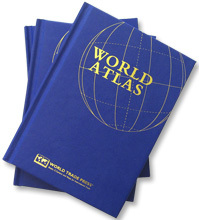 The World Trade Press World Atlas, Desk Edition is a completely up-to-date, high-quality, full-color atlas that contains 52 two-page spread regional maps of the world, 10 world city maps, a 160-country data section and comprehensive index. Our World Trade Press World Atlas, Desk Edition is printed in full color on coated paper, with sewn signatures and hardcover binding. The new World Trade Press World Atlas (co-branded with your company name and logo) is the perfect way to promote your company as an international business. Our new World Atlas provides the most up-to-date data, is printed in full color on the finest matte-coated paper, and is hard-back bound with sewn pages for durability.